For those who know me, you know writing is not one of my strong points, but I do love to read. Last year, I didn't have much time to read given the new job and pending arrival of Micro JG. Now that I'm on mat leave, despite the craziness of having two kids, I have a bit more time to sit down and enjoy some good reads. One of my two New Years resolutions was to read one book every week (or two). To help hold me accountable, and to see how far I actually get, I decided to post reviews of the books I read here on my blog. 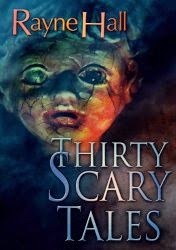 The first book on my list is Thirty Scary Tales written by Rayne Hall. This book has something for every thriller/horror fan with stories about zombies, vampires and the feeling of walls closing in on you. Of the thirty tales, The Devil You Know is the one that creeped me out the most. I have a high thrill threshold so I can deal with monsters & gore, but the thing that creeps me out the most is the feeling of being stranded. Rayne's descriptions of the abandoned train station sent chills up my spine. I also found Prophetess pleasing to read because of my love for Greek/Roman mythology. This tale was Rayne's spin on the story of Troy which I quite enjoyed. In the introduction, the author writes, "Fear is personal. ", and after reading this book I completely agree. At the end of each story you'll find a note on where the author has drawn inspiration for the tale. They were all from her personal experiences which for me, added an additional spook factor for some of the stories. Overall, I give this book 4 out of 5 stars. I would recommend this book to readers who are looking for an engaging read or an introduction to horror fiction. This anthology of short stories is the first book by this author that I've had the pleasure to read and it has instantly made me a fan of her work. I'll definitely be adding a title or two to my Book of the Week list. You can find Thirty Scary Tales for purchase on Amazon.com or Amazon.ca. For more information on Rayne Hall, you can visit her Amazon page here. Graeme Simsion's The Rosie Project is the next on the list. Click here to see the list of books and reviews for my 2015 Reading Challenge.